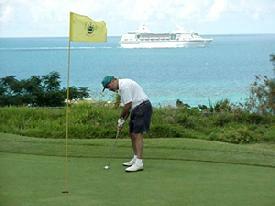 Golf was introduced to Bermuda when British Army officers brought their golf clubs in the late 1800s. Unlike tennis which was, golf did not get to the USA via Bermuda. In Scotland, UK, home of golf, the sport was introduced to the USA in the 1880s via the Dunfermline Golf Club to the Yonkers Golf Club and spread from the latter to all over the USA. Unlike in Scotland where anyone can play and visitors are welcomed by all clubs, private clubs in Bermuda welcome non-members only with an introduction from a member or if they are staying at an associated hotel (for example, at the Mid Ocean or Tuckers Point). 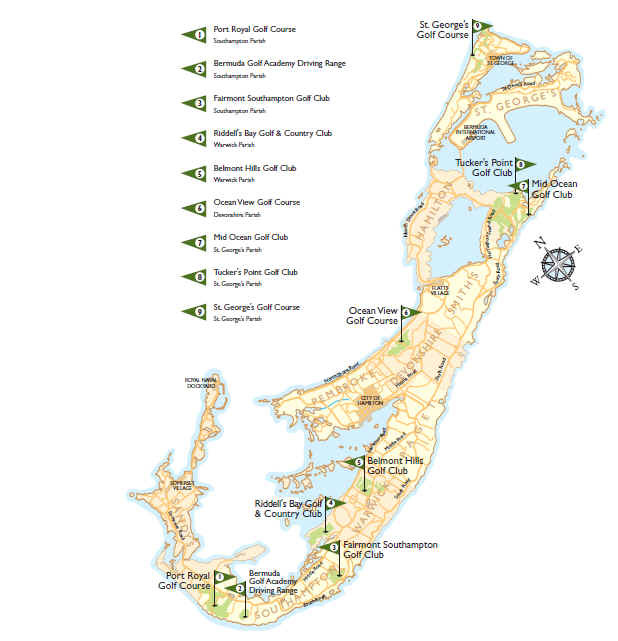 Most Bermuda clubs are private but three - Ocean View, Port Royal (Bermuda's second best) and St. George's (presently closed) - shown below - are public courses owned by the Bermuda Government (in other words, Bermuda taxpayers) but are not free, charge fees. All the latter three has a management committee, Board of Trustees and golf pros approved by the present government. Fairmont Southampton Golf Club, private, 18 holes, 2737 yards, par 54. Ocean View Golf Course. Public. 2940 yards, par 35. . See below re Bermuda Government's involvement. Port Royal. Public. 18 holes, 6842 yards, par 71. Reopened in January 2009 after renovations. PGA Grand Slam site, 2009, 2010, 2011, 2012, 2013, 2014. Riddell's Bay Golf and Country Club. Private. 18 holes, 5800 yards, par 70. St. George's Golf Course. Public. 18 holes, 4043 yards, par 62. See below re Bermuda Government's involvement. Closed for demolition of nearby hotel and redesign. Tucker's Point Golf Club, Private. 18 holes, 6361 yards, par 70. They are shown alphabetically below, in more detail. Easter Lily Invitational for Ladies. Hacker's Cup. Charity Golf Tournament, played at both Mid Ocean and Port Royal. 2018, October. Eighth Annual. Autumn golfing tournament pitting celebrities against journalists. Pompano Beach Club’s couples golf tournament tees off later in October, continuing a long tradition that started about 15 yeas ago. Ross "Blackie" Talbot Memorial Charity Invitational. Nike Golf PGA Team Championship of Canada, often in Bermuda. Annual Skyport, Aecon & Bermuda Airport Authority Charity Golf Day. See below. 2018. November 29. The 1st Annual Skyport, Aecon & Bermuda Airport Authority Charity Golf Day raised more than $30,000 for two local charities. The event was held on October 11 at Tucker’s Point Golf Club with all proceeds going to Mirrors and Big Brothers Big Sisters of Bermuda. Thirty teams registered to play with 120 golfers taking to the course for the inaugural event. Aaron Adderley, President, Skyport, says: “We are thrilled with the response to our first charity fundraiser. Mirrors and Big Brothers Big Sisters were both chosen for their positive impact on the lives of our young people. Skyport believes in supporting the education and development of kids by investing in schools and various programs, so for us, these two organizations were ideal charities to donate all proceeds to. We look forward to an even more successful event next year.” Thanks to sponsors and partners, the 1st Annual Skyport, Aecon & Bermuda Airport Authority Charity Golf Day was able to raise $33,737 for charity in its first year. Many of the sponsors included subcontractors who are presently working on the site of the airport redevelopment project. Patrina O’Connor-Paynter, Managing Director, Big Brothers Big Sisters of Bermuda, says: “On behalf of Big Brothers Big Sisters of Bermuda, I would like to thank Skyport, Aecon, Bermuda Airport Authority and their partners for their commitment to the youth of Bermuda. We are truly grateful for this generous donation. We are also excited that members have reached out looking to get involved in both the BBBS and Mirrors programs by offering their time and various skill sets. This fundraiser has also encouraged BBBS and Mirrors to look at other ways we can collaborate and build on our relationship. Thank you for being a part of our village.” Kimberley Jackson, Programme Coordinator, Mirrors, says: “On behalf of the entire Mirrors family, we are very much appreciative of this generous donation from Skyport, Aecon and Bermuda Airport Authority. The Mirrors Programme is committed to the success of youth. Our aim is to connect them to opportunities that can lead them to success, allowing them to participate as productive citizens of our community. This donation will allow us to further our cause and build on the relationship between Mirrors and Big Brothers Big Sisters. With help from supporters like Skyport, we will strengthen our youth and families for a better Bermuda. Thank you!” Sponsors for the event included Aecon, Argo, BAC Group of Companies, BCM McAlpine, Benson Steel, Bermuda Scaffolding, Burrows Lightbourne Ltd, Correia Construction, Current Vehicles, Digicel, Fairmont Southampton, Fish Construction, Foursite-Greymane, Glidepath, Grotto Bay Beach Resort, Hamilton Princess, HDDC, iHope Global, JetBlue, Kaissa, Lili Bermuda, LinkBermuda, Menzies Aviation, MEF, NYIAX, NORR, NR Windows, Palgag, Performance Solutions, Peugeot, Sea Cargo Air Cargo/Best Shipping, Rosewood Bermuda, Sea Link Construction, Security Associates, Scott Associates, Stantec, St. George’s Club and Update Group. Victoria Place, 31 Victoria Street, Hamilton HM 10. P. O. Box HM 433, Hamilton. Phone 295-9972 or fax 295-0304. Designers of the ten local courses include Charles Banks, Deveraux Emmett, Robert Trent Jones, and Charles Blair Macdonald. There will eventually be a new one on the 250 acre former US Naval Annex in Southampton Parish - in an area now re-named Morgan's Point - but it is several years away. Many international events occur in Bermuda. Check directly with the golf clubs shown below for rates for playing, tee-off times, temporary or regular memberships, carts or pull carts, clubs, lessons and any specials. Golfers in these islands since the 1940s have included Dwight Eisenhower, Jack Kennedy, Richard Nixon, George Bush and Jimmy Carter; Winston Churchill, Harold Macmillan and Edward Heath; Britain's Royal Family; and Babe Ruth. They, Bob Hope and countless others have enjoyed local conditions. Some local golf clubs give lower rates to local senior citizens who are members but not to non-locals. Golfers can now book up to 60 days before tee off. 25 Belmont Hills Drive, Warwick Parish, WK 09. Telephone (441) 236-6400. Fax (441) 236-0694. Check rates directly with course depending on time of day and time of year. Private but will accept off-the-street golfers by prior appointment. features include Sunset Rate. Carts are mandatory for most of the day. It was designed originally by Deveraux Emmett and first opened for play in 1924. Formerly the Belmont Golf Club, then connected with the now-defunct and destroyed Belmont Hotel, mostly recently the Belmont Hills Golf and Country Club. From September 2001, it became under the management of Belmont Golf Course Management Ltd, 97 Middle Road, P. O. Box WK 251, Warwick WK BX. For visitors who arrive at the airport on one of the commercial airlines or cruise ships, the closest cruise ship berth is City of Hamilton, about 4 miles away to the east. If you bring your own clubs, you won't be able to go by public transportation (bus). Instead, take a taxi. Or if without clubs, consider taking the # 8 bus - the only way by public transportation - most of the way to the course. It has an 18 hole. 6,017 yards long course, par 70. Facilities include a pro shop, snack bar and restaurant. A periodic Golf Special including green fees and cart is available from Monday to Friday for tee times from 2:00 pm. It closed in January 2002 for up to 15 months, for very extensive renovations (shown below). The course was reopened on June 1, 2003. It is more challenging, less hazardous and more attractive, designed by Californian Algie Pulley and his son Jeff, both of whom had had earlier carried out improvements at the former Castle Harbour course. This one has greens made faster by Tiff-Eagle sprigs, fairways made more lush by an irrigation system and a million-gallon lake located between holes two, seven and eight. Golfers are steered away from residential areas. Holes 1 and 2 remain much the same s before but the third dog-legs up towards a new green just below the 4th green. The original 5th hole became the 4th and the original 6th the 5th, with a new green further to the left than before. The original 7th became a new par-five 6th winding its way through the lakes, with the 7th a new par-3. Rather than a dog-leg, the 8th is short, tight and straight and 9th almost the same but with the green moved slightly to the left with a new clubhouse to the left. The old 10th is the present 15th and 11th is where the 14th was. Each has new greens. The present par-5 10th became an even longer 12th, with a new green on the original 11th fairway. The 11th became the 13th, a straight par four over the existing "Ian Crowe" lake. With safety in mind, the old 12th became the 14th, directed away from houses to the right. The 15th, 16th, 17th and 18th remain much as they were, except the 16th has a new green 30 feet to the left to take play away from homes on Belmont Road. Rubble taken from the demolition of the old Belmont hotel was used to fill in the large hollow on the 18th, long considered the most unfair of the golf course. With protected caves underneath the fairway, decisions were taken on how best to level out the land. Overall, accurate iron play, rather than big hitting, is the key to success on this course. Take care to try to avoid hitting the ball into the lake. Bermuda Government appointed under the Golf Courses (Consolidation) Act 1998. See Bermuda Government Boards. Since 2015. At Dockyard. Mini golf course. A favourite of locals and overseas guests. 1 Mid Ocean Drive, Hamilton Parish (East End). Phone (441) 293-0330. Fax (441) 293-8837. Bermuda's number one private course. A private club, an introduction is needed from a member, or try an hotel's Social Desk or cruise ship's Shore Excursion office. The first three holes run parallel to the ocean. Designed originally by Charles Blair MacDonald to fit into the natural terrain. It was a par-71 layout, over 600 acres of rolling countryside, 6,519 yards from the back tees. MacDonald won the first US Amateur Golf Championship in 1895 and later designed the National Golf Course in the USA. The course first opened for play in 1921 and was officially declared open in 1922. Ralph A. Kennedy of Mamaroneck, NY, regarded at the time as the "Dr. Livingstone of Golf," rated it one of the five best courses in the world in the 1920s. It was revised in 1953 by international golf course architect Robert Trent Jones. In the 1990s this course hosted the Merrill Lynch Classic and later the Gillette Classic. All the greens were re-built in 2002. The club played host to the PGA Grand Slam of Golf in 2007 and 2008. Today, it is ranked the 47th best golf course outside of the United States by Golf Digest. In October 2015 it hosted the inaugural Nike Golf PGA Team Championship of Canada and it is hoped this can be repeated. Distinguished persons who have played there include heads of state as Presidents Dwight Eisenhower; Richard Nixon; John F. Kennedy; Jimmy Carter; George H. W. Bush and Dwight Eisenhower; The Duke of Windsor; Winston Churchill; Harold Macmillan; Edward Heath; former Canadian Prime Minister Brian Mulroney. Golf celebrities have included Sam Sneed and baseball icon Babe Ruth. When the latter, normally as good with a club as he was with a bat, played the 433-yard fifth, known as the "Cape," he knocked eleven straight balls into Mangrove Lake before finally driving one over the hazard. For visitors who arrive at the airport on one of the commercial airlines or cruise ships, the closest cruise ship berth is Town of St. George, about 5 miles away to the south west. If you bring your own clubs, you won't be able to go by public transportation (bus). Instead, take a taxi. If without clubs, take the # 1 bus to property and walk. Check rates directly with course depending on time of day and time of year. Private but will accept some off-the-street golfers by prior appointment if referred by a member. Ask about playability on the day you have in mind. 2 Barker's Hill Road, Devonshire Parish DV 05. P. O. Box DV 358, Devonshire DV BX. Phone (441) 295-9092. Fax (441) 295-9097. 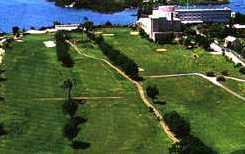 A Bermuda Government-owned public golf course, the regulatory agency of which is the Ministry of Tourism, charging membership fees to locals and admission fees to tourists and visitors. A 9 hole par 35 course over 2,819 yards. In the past, the trustees and Government had relied on the Port Royal course to subsidize Ocean View. The problem with Ocean View is the traffic. It's only nine holes so unlike an 18-hole course you can only have so many on the course at any one time. Ocean View historically has been a working man's club and was taken over by Government in the 1990s but before that it was run by the members. The site of one of the units of the clubhouse here was once a grand old manor house known as Watlington House, now used as a storage facility. It was used for British Army purposes during World War 2. The former Fort Langton and part of its structure were used as the foundations for the clubhouse after the war and more of the former fort became the bus garage in the 1970s. On the field below the bus garage, now the golf course, were two US Army posts during World War 11. One was a unit of the US Army Signal Corps and the other was the US Army's Artillery, at APO 856. It was a unit (including 1st Platoon Battery A) of the 423rd Field Artillery Group, under the command of Captain F. W. Clipper, US Army. For visitors who arrive on one of the cruise ships, the closest cruise ship berth used to be (until 2007) the City of Hamilton, about 5 miles away to the east, but is now Dockyard, about 12 miles away. If you bring your own clubs, you won't be able to go by public transportation (bus). Instead, take a taxi. Buses only go a part of the way. Check rates directly with course depending on time of day and time of year. Public. Ask about playability on the day you have in mind. 5 Middle Road, Southampton Parish, SB 02. Mailing address P. O. Box SN 189, Southampton, Bermuda SN BX. Phone (441) 234-0974. Fax (441) 234-3562. It opened in 1970 as a Robert Trent Jones-designed 18 hole, 6,561 yards par 71 public course. Re-opened in January 2009 after a final-cost $15.9 million (originally $7 million budgeted) renovation of the 37 years old course including increase of the course yardage by 281 yards to 6,842 yards. 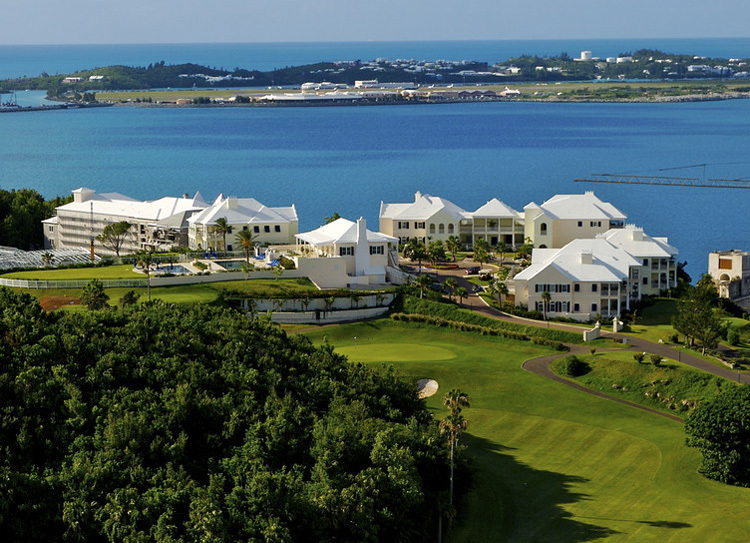 In June 2006, the Bermuda Government's House of Assembly passed an Act that switched responsibility for the Government golf courses from the Ministry of Works & Engineering to Tourism. 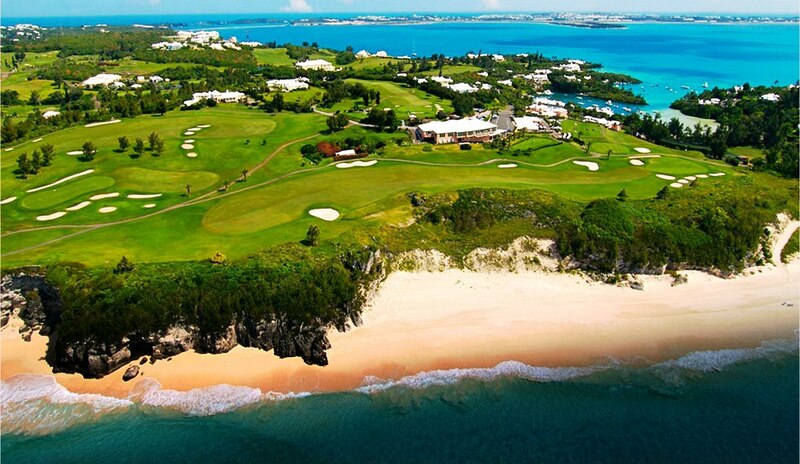 It hosts many tournaments and has been the home of the Bermuda Open. Sunset golf is from 4:00 pm with a reservation. Since it re-opened, a $3,000 initiation fee became applicable, plus a yearly subscription of $3,500, but some elderly Bermudians are exempted from the former. Also, Bermudians pay 30% less than visitors. For visitors who arrive on one of the cruise ships, the closest cruise ship berth is Dockyard, about 8 miles away. Buses go to nearest stop about 600 yards away. If you bring your own clubs, you won't be able to go by public transportation (bus). Instead, take a taxi. Check rates with course depending on time of day and time of year. 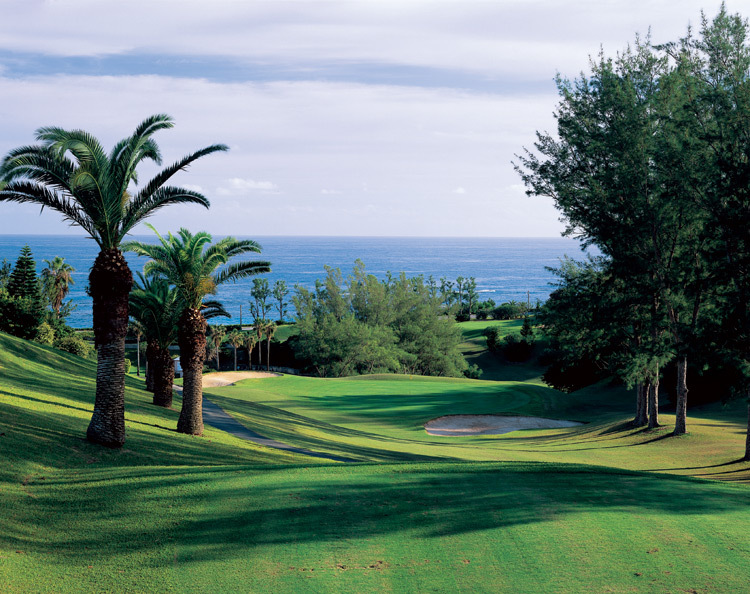 This is the highest-rated by far of Bermuda's two government-owned and run courses, considered one of the best - and most expensive - of world public courses. More rounds are played here than on any other Bermuda course. The signature hole has been the 176-yard, par 3 16th, the small green of which, perched on the edge of the coastal cliffs, has become notorious. Drive too far left and the ball ends up in the ocean. Site of the October 19-21, 2009 and 2010 PGA Grand Slam venues. With these in mind, in a $14 million Bermuda taxpayers investment, the greens were rebuilt, a huge amount of earth was moved by bulldozers, new sand put into trickier bunkers, cart paths repaved, a landscaping project completed, a new restaurant - 64 Degrees - and bar, pro shop and locker rooms, re-routing two holes, creating new bunkers, a computerized irrigation system from tees to greens, and the planting of TifEagle on redesigned greens. Bermuda Cedar trees also replaced Casuarinas and the course was lengthened to 6,842 yards, to make it the longest on the Island. The reverse osmosis plant produces 250,000 gallons of water per day on 1,200 new sprinkler heads. Here, as grounds workers, until September 2010 the Bermuda Government employed four men, Uighurs, who were once prisoners of the USA at its notorious Guantanamo Bay detention camp as suspected terrorists. 26 Riddell's Bay Road, Warwick Parish WK 04. P. O. Box WK 236, Warwick, WK BX. Phone (441) 238-1060. Fax (441) 238-1203. The club opened in 1922. It was the first 18-hole course in Bermuda, originally over 5549 yards and was designed by Deveraux Emmett (who also designed the Congressional Golf Club near Washington, DC). When the Duke of Windsor played there in August 1940 during his stopover in Bermuda on his way to the Bahamas as Governor with his American wife, he pulled off a spectacular shot on the home hole. The course is now par 69 over 5,588 yards. Privately owned, an introduction from a member is required for non-members. With a bar and restaurant. 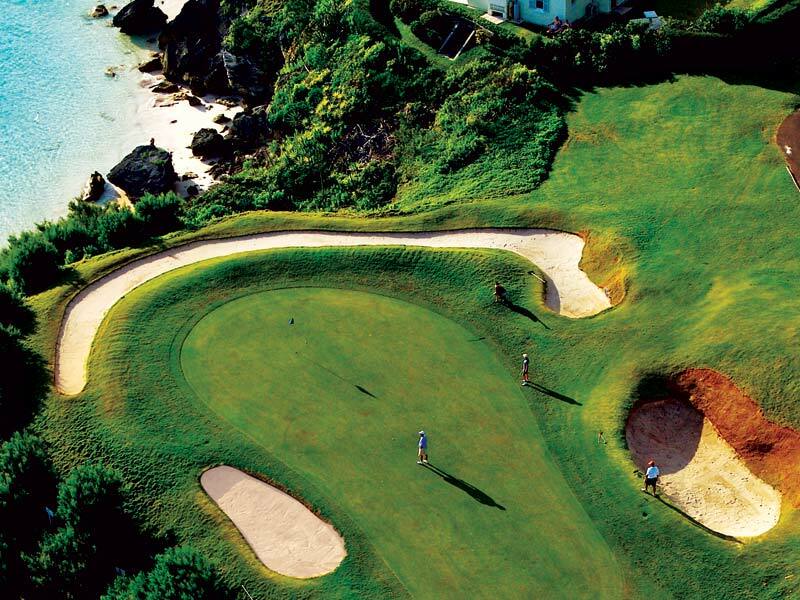 On a peninsula, the first hole is the most difficult in Bermuda. Closed at this time but reopening in late 2018.. 1 Park Road, St. George's GE 03. North of and near Town of St. George. Not on bus route. Phones: Office 297-8067 (fax 297-2273); Pro Shop 297-8353; Golf Pro 297-3660; Tee Times 234-4653; Maintenance 297-8370; Restaurant/Bar 297-1836. An 80 acres scenic 18 hole par 62 course over 4,043 yards, first opened in 1985. This was one of the last designed by Robert Trent Jones Senior prior to his retirement. Cruise ships pass by. Extensively renovated in most of 2006 to 6,000 yards and redesign by top British golf professional and winner of six Major tournaments Nick Faldo, by his corporation Faldo Design. For golfing visitors who from 2018 will be arriving at the airport on one of the commercial airlines or cruise ships, the closest cruise ship berth is the Town of St. George, about 2 miles away to the south. Until it closed, many cruise ship visitors played this course. Buses (# 1 or 3 or 10 or 11) go part of the way. The 18th hole is named after Bermuda's first Governor, Richard Moore. One of the greens overlooks historic Fort St. Catherine. Re-opened briefly in part in May 2011 after being closed since July 2008, as a joint venture with the Bermuda Chamber of Commerce, the St George’s Club and the government's Economic Empowerment Zone (EEZ). The course was then maintained at a similar level to municipal courses in the UK. But because it was losing money for the Bermuda Government which owns the course and the latter wanted to allow for building of a planned adjacent new Park Hyatt hotel it was again closed. The hotel development never began until April 2017, which is why the golf course has remained closed. Now that the new St. Regis Hotel, is finally going to be built, with completion due hopefully by late 2018, the Bermuda Government has confirmed the new course will be taken out of state hands and run (although will still be owned by the government) by the hotel development company. When reopened from late 2018 the course will likely be offered to both St. Regis Hotel guests and the general public. 60 Tucker's Point Drive, Hamilton Parish (East End). Phone (441) 292-6970. Fax:(441) 298-4001. Originally designed by Charles Banks and Robert Trent Jones for what was then the Castle Harbour Hotel, with later amendments by Californian Algie Pulley, it began as an 18-hole course, but was cut back to 9 holes during World War 2. It became a challenging 18 hole, par 71 course over 6,440 yards with sea views, when it was opened by the Governor of Bermuda in December, 1959. It has a scenic opening hole and incredible views. But with closure of the Castle Harbor hotel, it became 9 holes from January 10, 2000. It was completely re-vamped and reopened in April 2002 as 18 holes again. Of a very high standard, it is a private club for members only, similar to the Mid Ocean Golf Club. A par 70 course. The re-vamped Tucker's Point Golf, Beach and Tennis Club was formally opened in December 2004. Numbers 13 and 17 are new signature holes, back to back in east and west directions. # 17 has sweeping views of Tucker's Town and Castle Island. #13 has a panorama of the entire north coast and west end of the island with spectacular vistas and sunsets. The old number 10 is now number 12, reconfigured. Number 9 has been re-laid. Rye grass, Bermuda grass and a hybrid Bermuda grass have been used. The facilities also have clay tennis courts. For visitors who arrive at the airport on one of the commercial airlines or cruise ships, the closest cruise ship berth is the Town of St. George, about 6 miles away to the east. Take a taxi as buses (#1) go only to nearest stop about half a mile away below the hill. Check rates directly with course depending on time of day and time of year. Private but will accept off-the-street golfers by prior appointment. Ask about playability on the day you have in mind. Situated between the harbors of St. George's and Castle Harbor, Tucker's Town was so-called because it was intended by a Bermuda Governor by the name of Tucker to be a port to rival St. George's. But it was far more exposed to the weather and failed to attract many early settlers. So it was never built. In 1781, 40 acres of cotton were found growing here, which led directly to the British government encouraging the planting of cotton as a commercial crop in 1788. The golf driving range was once a neglected, not dug-up, cemetery. Ancestors of present-day black Bermudians (the great majority) are buried there. The tiny gravesite is surrounded by a wall of fairly recent vintage. While it contains the remains of only 12 or so known graves of the last century it is believed many more black men, women and children were much earlier planted without graves or coffins in the golf greens outside the wall. The original Tuckers Town - see http://www.bermuda-online.org/seestgeo.htm then under "Tucker's Town - of which this golf course is a part - represented a Black community initially of free Blacks, and later of emancipated Blacks who struggled and successfully created a safe and isolated environment for their families by building their own school and church, and creating a community made up of land owning farmers, pilots and fishermen. Their lands were acquired by Bermuda Government (then white) compulsory purchase order in the 1920s for commercial tourism development. Fairmont Southampton Hotel, 18 South Road, Southampton Parish SN 02. For reservations call (441) 238-8000. Fax (441) 238-8968. The golf course is part of and adjacent to the Southampton Princess Hotel complex. An 18 hole par 54, manageable yet quite challenging course over 2,684 yards. With superb marine and landscape views. Carts are mandatory and included in the green fees. There's a pro shop, tennis courts, bar and restaurant. Single Annual Membership; Double Annual Membership and an Initiation Fee. Members get special benefits. For visitors who arrive on one of the cruise ships, the closest cruise ship berth used to be (until 2007) the City of Hamilton, about 5 miles away to the east, but is now Dockyard, about 8 miles away. If you bring your own clubs, you won't be able to go by public transportation (bus). Instead, take a taxi. Buses (# 7 or 8) go only to nearest stop about half a mile away below the hill. Check rates directly with course depending on time of day and time of year. P.O. Box HM 224, Hamilton, HM AX. A very successful local sports development program, begun in 1975 when the Bermuda Golf Association (BGA) formed the Golf Development Committee which forged the basic development for junior golf in Bermuda. 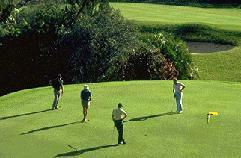 It invests hugely annually in public golf course expenditure. The Board of Trustees of the Government-owned golf course pays over $3 million a year in salaries at Port Royal alone, including consultants for the course. Mechanics at the government golf courses earn over $63,000 a year while the General Manager earns over $115,500 and Assistant Superintendents earn between $80,000 and $93,000. Formed in 2012 to cater to female professionals looking to up their game both on and off the golf course. The Bermuda Chapter of Executive Women’s Golf Association (EWGA) held informational sessions. Initially funded by the Department of Tourism and supported by golf directors from the Bermuda’s golf courses. The international organization consists of more than 14,000 members in over 125 countries and have corporate partners including the PGA, Golf Digest, Golf World and the Golf Channel. The Professional Golfers Association of America (PGA) organization was formed in the United States in 1916 at the instigation of Rodman Wanamaker, a Philadelphia businessman, with the stated purpose of promoting interest in professional golf, elevating the standards of the game, and advancing the welfare of its members. By the early 21st century, the PGA had a membership of more than 25,000 playing and teaching professionals. The PGA Grand Slam of Golf is for the winners of the four majors in golf — the Masters, the US Open, the British Open and the PGA Championship. It was held yearly in Bermuda from October 2007 through 2014 at considerable cost to Bermuda's taxpayers. The Department of Tourism struck a deal with the PGA of America to play the prestigious 36-hole, $1.25 million event initially at the Mid Ocean Club (see below) from October 16-17, 2007, again in 2008 at the same place, then from 2009 to 2014 at the renovated Port Royal, instead of in Hawaii. It reached a worldwide audience of 88.9 million US homes and international viewers in more than 100 countries. 2013. 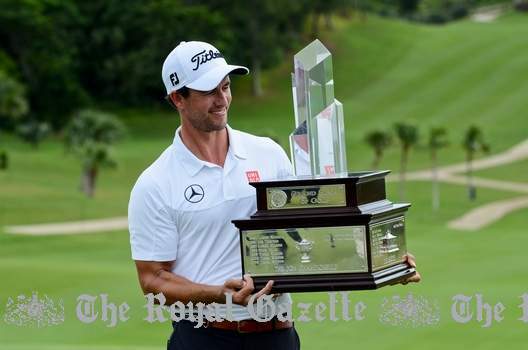 Won by Masters champion Australian Adam Scott who broke the course record with a 7-under 64 to win by two shots over U.S. Open champion Justin Rose. 2012. Won by Padraig Harrington. 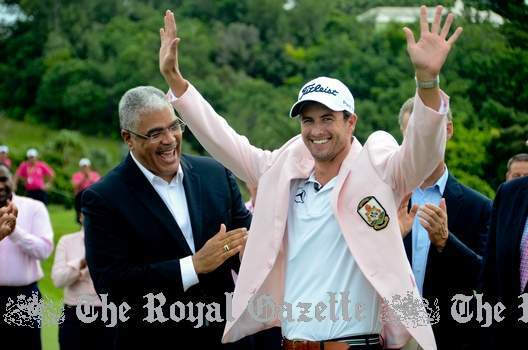 Bermuda 2013 PGA Grand Slam winner Adam Scott and below, with Bermuda's then-Premier Craig Cannonier. Winner is wearing Winner's Pink Jacket with Bermuda Crest, presented by Mr. Cannonier.